Life & Beyond : NOW 'A KANHAIYA KUMAR UNBECOMING OF A JNU STUDENT': HOW WILL IT FURTHER MUDDY THE WATERS? NOW 'A KANHAIYA KUMAR UNBECOMING OF A JNU STUDENT': HOW WILL IT FURTHER MUDDY THE WATERS? An assistant professor of the Delhi University, who is also a former student of the Jawaharlal Nehru University, has come out with an open letter addressed to Kanhaiya Kumar, the arrested and out on bail JNU Students Union president, slamming him for his recent 'reincarnation' and his 'for women' views expressed on the International Women's Day terming him a 'false revolutionary' and misogynist. And after reading her letter you can feel why she is so outraged - that why she cannot be dismissed. 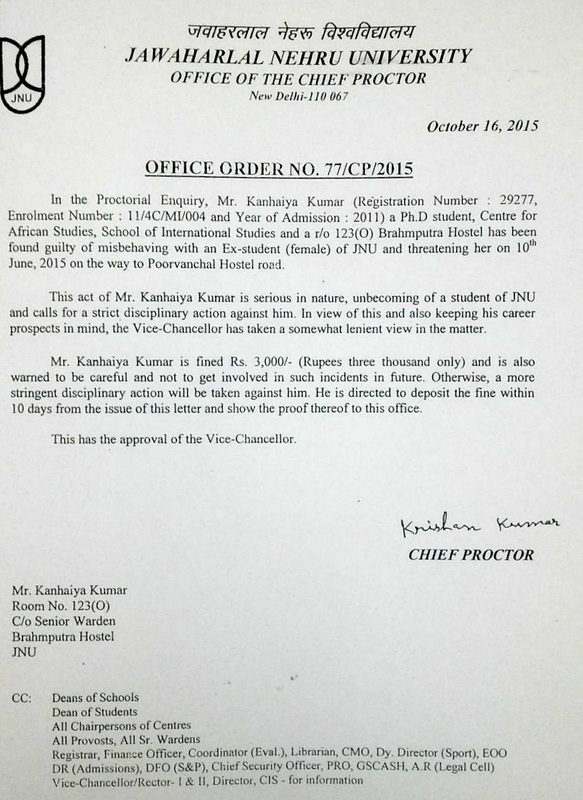 And the way her Facebook posts with her complaint letters and this letter by the JNU proctor finding Kanhaiya Kumar guilty of the offence, using harsh words against him, and imposing fine on him, have gone viral is emblematic of a trend that is witness to the rise of the social media and how the mainstream media picks threads from it. This trend picked out Kanhaiya Kumar from obscurity to put him into the nation's conscience in a matter of few weeks only. And social media, well, can be his rapid undoing if he doesn't read the path cautiously now. Because anything and everything related to Kanhaiya Kumar and JNU is under intense scrutiny now and it is just the matter of days when something hostile will go viral like this revelation by a former JNU student has gone. She had written her first post on Kanhaiya Kumar on February 16, attaching hand-written copies of her complaint, but obviously no one took note of it. Also, the nation's sentiment was more or less with Kanhaiya Kumar and JNU then. She wrote her open letter on March 3, in the morning and Kanhaiya Kumar was released on bail later in the evening. He delivered a terrific speech that night in JNU that he termed was accumulation of his experiences in the jail. And so how could've anyone noticed this open letter then and there, even if it was very pertinent? But after this, Kanhaiya Kumar started derailing, like an immature student, devoid of pensive thoughts (though still with difficult words). And so, anti-Kanhaiya Kumar images (and words) started finding inroads - with people now open to listening to the other side of the story. And when she posted yesterday an unsigned version of this letter from October 2015 - letter that castigated Kanhaiya Kumar finding him guilty of obscene behaviour with a female student - it picked up threads - and went viral today when she posted the signed version of this letter. This is the classic way the social media works - doing and undoing - making and derailing. Let's see how this big revelation, that is clearly anti-Kanhaiya Kumar, further muddies the waters. Any attempt to stonewall it or confront it with verbal bravado will only help those who openly opine against JNU. And for us, the common folks, the loss of another promising leader - it is nothing new - especially after the Aam Aadmi Party experience in Delhi. Here is the Facebook link of that assistant professor from DU and that former student from JNU.